Little girls love princess, but eco, feminist parents lament the adoration of helpless females who need rescued by princes. My daughter has thankfully moved away from the princess phase, no matter how much I tried to shield her from its influence from the start, but she often still asks about real princesses. I tell her that yes they exist, but that royal families aren’t necessarily role models. Now, I have found a princess that is inspiring her subjects to grow organic vegetables. Sometimes the princess cuts vegetables in the backyard herself. The vegetables grown in the palace are served on her table. The princess also sells home-grown vegetables at reasonable prices. Some of the surplus produce is processed and sold. Fruit including jackfruit, tamarind and papaya were donated to the nearby Nan Panyanugul school for mentally challenged children. Money raised by the princess’ organic farm is used to fund the promotion of organic gardening in the province. If only one of the Bush twins would take up such a worthy cause, or perhaps the White House lawn could be turned into an biodynamic farm. We might not have an eco first family in the US, but at least Thailand has an organic princess. Love this. I too have been anti-princess, but this is cool. Great post. HRH Princess Maha Chakri Sirindhorn is a great role model not only in relation to organic farming. She is a simple, down-to-earth, non-elitist yet regal and dignified princess who has given herself to her people. In all her 53 years thus far, HRH has worked tirelessly for her people and country. Whoever has heard of princesses who regularly goes around the remotest and uncomfortable places to check on the development of the people in those areas and paying for infrastructure with her own personal savings? She can often be found working under the scorching sun. HRH is extremely intelligent, holding two masters degree and a doctoral degree and proficient in more than six languages. She certainly does not fit into the traditional image of princesses where they are all dolled up, not a hair out of place, with stunningly expensive clothing and jewellery holding on to the arm of their princes in shining armour. 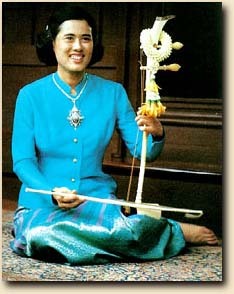 HRH Princess Sirindhorn is my kind of princess, who can more than take care of herself. What’s more, she takes care of millions of people who are benefiting from her hardwork.